This dissertation is concerned with the development of grammar. Starting from a usage-based perspective, which holds that children use domain-general learning mechanisms to acquire the grammatical patterns of their mother tongue, Beekhuizen shows how to operationalize various concepts from this tradition in a computational model. In order to arrive at a sound set of assumptions, Beekhuizen compares and criticizes various earlier usage-based modeling approaches and scrutinizes the concepts of a usage-based theory of language acquisition from the perspective of a computational modeler. As the model should be able to produce utterances on the basis of a meaning to be expressed, as well as to interpret utterances, the availability of meaning from the situational context is studied empirically. 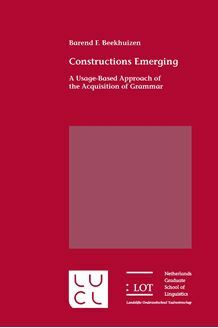 The resulting model, the Syntagmatic-Paradigmatic Learner, simulates an increasing ability to understand utterances on the basis of a grammar of constructions, as well as to produce utterances on the basis of this grammar. Several developmental effects are simulated and the internal states of the model are carefully examined. This work is relevant to language acquisitionists, researchers interested in computational cognitive modeling, as well as researchers working in the usage-based, constructivist framework.